"Kodachrome, they give us those nice bright colors. They give us the greens of summers. Makes you think all the world's a sunny day." The words of that old Simon and Garfunkel tune ran through my head when I was looking at some old photographs the other day. I suddenly realized as I ruffled through a box of photos that photographs, the kind that most of us grew up with, are quickly become an anachronism. Today we talk about images and not photographs, we store them on hard drives and not in cardboard boxes, and we view them on computer screens or send them as attachments in an email. Back in the day JC purchased a pocket sized 35 mm camera to carry on the stream. I think it was a Rolex. It was a 'point and shoot' view finder model, and it took great pictures. Not being as flush as JC I purchased a similar camera from Sears. Over the years I have taken hundreds of pictures with that little camera and the picture quality is good enough for publication. Until I switched almost exclusively to digital cameras I was still using that little old camera. Carrying a camera on the stream provides a visual reminder of your day on the water. You can use the images as an appendix to your fishing log. Most of the modern cameras have a macro mode that will allow you to make images of the flies you used, and even take reasonable images of the actual insects. They will allow you to preserve images of your fishing buddies and the places where you fished. 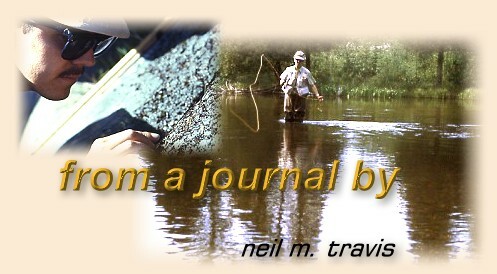 Recently an old friend emailed me several images of him fishing on the Au Sable River in Michigan. For many years this was my home water, and I spent many days fishing and camping with this old friend in that place. I have not seen him or that piece of water in over two decades. Such is the magic of the visual image. Photographs or digital images are pieces of time forever frozen on a piece of celluloid or as pixels on a computer chip. When you look at a photograph you hold a piece of the past, an instant in time that is forever gone except in this frozen image. Photographs are our attempt at freezing time, of creating permanence in an impermanent world, of seizing immortality where only mortality reigns. The people in old photographs never get older. They smile up at us from across the sands of time; forever young, forever happy. They speak to us of times gone by, of places and times that exist now only in those images and of people whose names we may have forgotten, of people who, like those times, no longer exist. With a photograph we strike a blow against time and the intransigent nature of our existence. They remind us of happier times.